Download our guide to discover more before it gets any worse. Have you ever thought there must be more out there to help, other than just pain medication? This report gives results in helping with natural Pelvic Girdle Pain treatment. At the very least, reading this report will give you some tools to feel more empowered and engaged in your own recovery. Read this report to help you with an easier pregnancy. But everybody we see wants to the answer these questions. We want to help you on your pregnancy journey and to help you have a natural childbirth. "Will this effect my baby?" Most people think that when they get Pelvic Girdle Pain and SPD, it'll go away on its own. They’ll wake up one morning and like “magic”, it’ll be as if it never happened… But this is not the case. As the baby grows the symptoms increase. Let's face it - everyone wants a comfortable happy pain free pregnancy. Using these top tips will put some pain-free, engagement and quality back into your life and never have to guess. Just fill out the form below to grab your report, then go fourth and do the work! Absolutely. Just sharing some free knowledge that we hope you’ll find useful. Keep us in mind next time you have questions related to your back pain. Our Chiropractors would be more than happy to help you answer any questions you may have. Life Balance is a unique chiropractic system and process that helps families maximise engagement, quality of life and life balance. We house an award-winning & recommended family Chiropractors. your friendly chiropractor Poole. 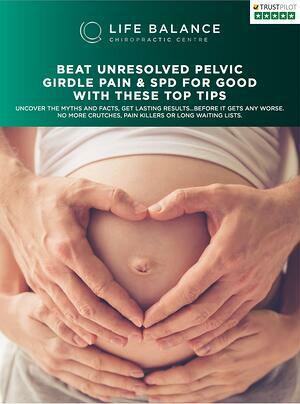 Have you read our blog post on Pregnancy Posture? Discover more here.